Introduction ► Contents ► Types of Entry ► Recording Things ► Questions. Whether they are queries on your fictional characters or contemplations about real people, the whys, hows, whats and wheres will always keep occurring, and until you know an answer what better place to keep the question current than in your journal. Similarly with the observations you may make of things and events. The more curious you are about your observations, the more unanswered questions there will be for your journal. Questions are good, questions are powerful, questions indicate new and exciting discoveries are about to be made. It is easy to dismiss those pensive thoughts, the odd meditative pondering and occasional wistful contemplation. They may feel as if there is “nothing solid to report” and so you might easily overlook those questions and fail to record them. Instead of thinking of them as being insubstantial, consider them to be “doors to understanding”, important openings to new knowledge. However, all the questions in the world will never amount to anything unless time is taken to provide answers. Our opportunity to provide the answers, when journaling for creativity, comes during the periods of review. These are the times when your questions can receive further consideration and either find answers or add actions in our diary to find them later. Neat tip: Get into the habit of adding a large question mark in the margin whenever you pen a question. This makes it easier to spot the questions whilst reviewing. Also, when you answer a question, put a big tick through the question mark, to show clearly that it has been answered. If you answered your question in another journal entry, pop the date of the new journal entry under the question mark to make the answer easier to find in the years to come. 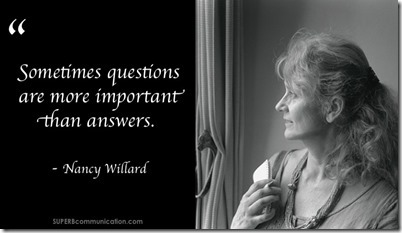 As Nancy Willard states, “Sometimes the questions are more important than answers.” since they prompt interest and develop an innate curiosity. An initial question often leads on to a string of additional questions, each one highlighting a further gap in your knowledge or understanding. As a writer, consider also that your reader is probably unaware of your newly discovered trinkets of knowledge. Think then of how rewarding your prose could be when scattered with small “Ah ha!” moments as the reader comes across answers to questions they have not thought to ask. A journal prompt for you: Think of a book you have read where a small revelation has been made to you from within its pages. How did this make you feel? How did you value the book over another that was solely entertainment? Make a journal entry on your thoughts. Photo credit: Nancy Willard, by Maria Keckler of Superbcommunication. "Types of Entry: Recording things – Questions" by Andy Shackcloth is licensed under a Creative Commons Attribution-ShareAlike 3.0 Unported License.